لینک حاوی لیست توییت‌ها و هش‌تگ اختصاصی این توفان، یک ربع قبل از شروع توفان توییتری از سوی دست‌اندرکاران این توفان در بلاگ و ایونت فیسبوک مربوطه ارائه خواهد شد. On April 17, 2014 Ward 350 of Evin prison was raided and the political prisoners brutally attacked and beaten resulting in serious injuries for some of the prisoners. Despite the serious injuries that many of the prisoners sustained, 33 of them were moved to solitary confinement without providing medical treatment. The prisoners who were moved to solitary launched a hunger strike protesting the brutal attack on Ward 350. . In support of their fellow inmates in solitary confinement many of Ward 350 political prisoners have also launched a hunger strike. Despite the political prisoners and their families confirming the brutal attack, prison officials and the Judiciary officials continue to deny the attack calling it a routine inspection of the ward. Judiciary officials continue to deny the attack calling it a routine inspection of the ward. Please join us in supporting these brutally attacked and on hunger strike political prisoners by joining Tweet Storm on Saturday April 26 and help bring awareness to their case. لذت لمس همدلی در این روزگار، مزه ایست که در کلام نیاید؛ ممنون از شما! به عنوان یک هیچکس از این دریای شوق رهایی از شما سپاسگزاریم! و در انتها تشکر از تک تک عزیزانی که گمنام و بی‌ادعا در برپایی این پیشنهاد زحمات فراوان کشیدند. آنهایی که شاید هرگز تشکر از آنان با ذکر نامشان صورت نگیرد… تشکر کوچک ما را بپذیرید! • هش‌تگ اختصاص‌یافته به توفان توییتری یعنی DireHealth# – در لیست هش‌تگ هایی قرار گرفت که در دنیا روی توییتر ترند شدند. • هش‌تگ همراه توفان توییتری یعنی Iran# نیز در لیست هش‌تگ هایی قرار گرفت که در دنیا روی توییتر در اثر توفان ترند شدند. The joy of being united and of one heart is such that can not put into words. Thank you everyone. I, a nobody in this vast sea of yearning for freedom, extend my gratitude to all of you. This night was just as glorious as the night that our chirps were granted. This time also, our voices were undoubtedly received in the heart of humanity, saying, «We are human beings, and when there is a need to show humanity, we will be there. Our sense of duty transcends the time differences, cultural differences, different ideologies, the rancor that is woven by darkness around our thoughts, the fury induced by bitter wounds; none of which will interfere with what must be done. Finally, gratitude is extended to all the dear people who anonymously and un-pretentiously worked very hard to bring this proposal to fruition. Those who may never receive messages of gratitude by their name, please accept here our humble gratitude. The Tweet Storm is over, but it’s lesson of unity remains in our hearts, so we may more productively continue our struggle until such day that people such as Moradi, Nouri and Khazali and all of the freedom seekers, will no longer be enchained, and are free just as are their freedom seeking minds. So there will not be any more need for the nameless to show their support for the thirsty lips (the hunger strikers) by refusing food themselves. Maybe the next time we meet, will be the day that the Storms will die and the rainbow will manifest. 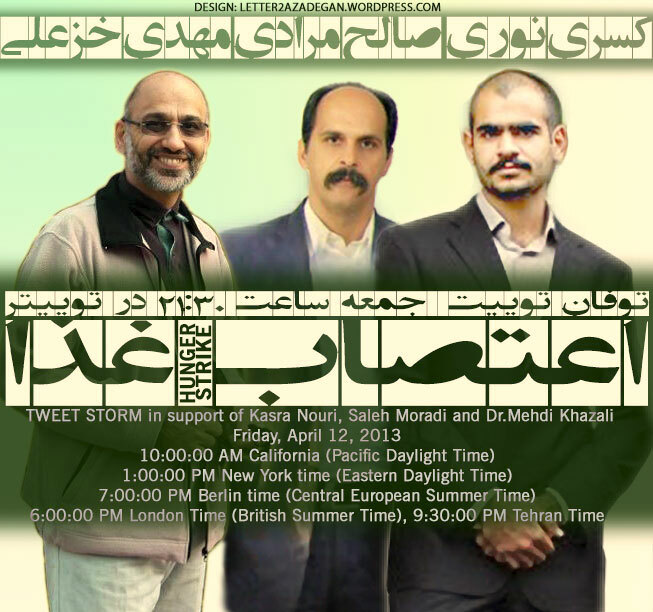 With great respect, to all the participants and the organizers of the Tweet Storm on Friday April 12, 2013. • There were approximately 6500+ tweets during the one and a half hour of the Tweet Storm. 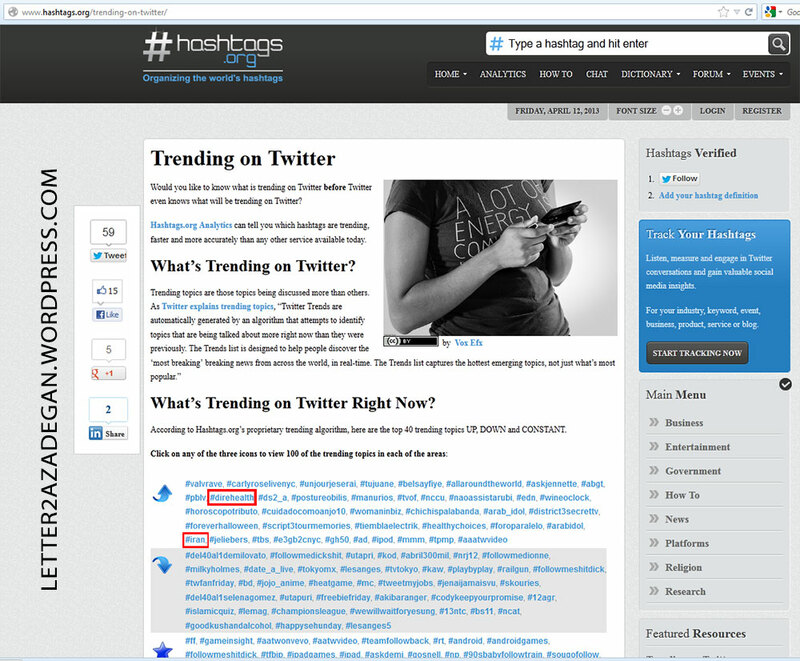 • The dedicated tag of the Tweet Storm, #DireHealth was among the Hashtags that trended worldwide. • The accompanying tag of #Iran was also among the Hashtags that trended worldwide due to the Tweet Storm. Early evening, around 7:30, my father called. Thank God his blood pressure and heart rate has become stable. He said the night before they wanted to take him to the clinic to administer an IV, but he told them he was tired and wanted to sleep. He slept until noon the next day. My father has lost about 30 kilos so far. وبلاگ نامه به یک آزاده با برنامه‌ی “پیشنهادی برای همدلی” با این رویکرد، بسیار دیر، راه اندازی شد. و با دستان کوچکش تنها شروع کرد به جمع آوری نجواهایی که صدایشان از عمق دلهای پاک مردمان جهان برخواسته. دوستان، اگر همدلی بزرگمان را گم کرده‌ایم بیایید تا دوباره پیدایش کنیم. همین حالا پیدایش کنیم. امروز که باز انگار همه‌چیز تکرار شده چرا ما همدلی خویش را تکرار نکنیم تا این شب‌ها که آزادگانی برای روزشدنش لب از غذا بسته اند دیگر تکرار نگردد؟ بیشتر از آن روز ایران دکتر خزعلی دارد این بار برای هر آزاده که می‌شناسیم و اینجا پر است از آنها قلم برداریم. از هرچه در دل می‌گذرد بگویید. شاید موضوعش شهیدی باشد که ندایش هنوز در قلبتان تاپ‌تاپ می‌کند. یا شاید بخواهید از آزادگانی بنویسید که این روزها غذا نمی‌خورند. یا آنهایی که آن روزهای نه چندان دور پرواز را انتخاب کردند… انتخاب با شما، و ما کنار شما واژه‌های قلبتان را فریاد خواهیم کرد. ولی نمی‌دانستیم واقعا این نجوا آنقدر بلند می‌شود که تا پشت دیوارهای قطور اوین هم نفوذ کرده. وقتی دعا می‌کردیم نمی‌دانستیم که دارد چه می‌شود… ساعاتی گذشت. دیروقت بود و توفان به پایان رسیده بود که کم‌کم زمزمه‌هایی آمد، زمزمه‌هایی شبیه یک رویا که دکتر خزعلی رها شده است و این حقیقت داشت و مُهرِ «افطار کرد» خورد بر روزشمار بی‌غذایی‌های دکتر خزعلی. همین عکس سمت چپ که از همه پایین تر است… توییت‌هایی که مستجاب شده بود! * منظور از توفان توییت که در شبکه ی اجتماعی توییتر صورت میگیرد، ارسال پیاپی توییت به شکلیست که اولا توییتها همگی دارای یک هدف مشخص باشند و ثانیا در زمان خاصی شروع شده و پس از مدت مقرری پایان یابند. هرکس میتواند از لیست توییتهای تعیین شده استفاده کند یا توییت های خود را داشته باشد. معمولا از تگهای یکسانی برای بالا بردن رتبه بندی لحظه ای آن تگ و رسیدن به هدف طوفان توییت که «جلب توجه» میباشد استفاده میشود. A night that Twitter remembers. If you were here you certainly also remember. Let us repeat that night. It was March 18, 2012. On that night some were praying, you may have also been praying. If you were here, you remember it well, and you will never forget it. It was a night that we were all hand in hand….and some may not know, but many hearts were together that night. Our tweets reached the heavens. It had been 71 days that night. An invitation to join a Tweet Storm was extended on Twitter from a few ordinary people, that their hearts were aching. It was a night just a few days from one year ago. It was last year; just last year. We heard about it and posted the news in a post called «The loud whispers». 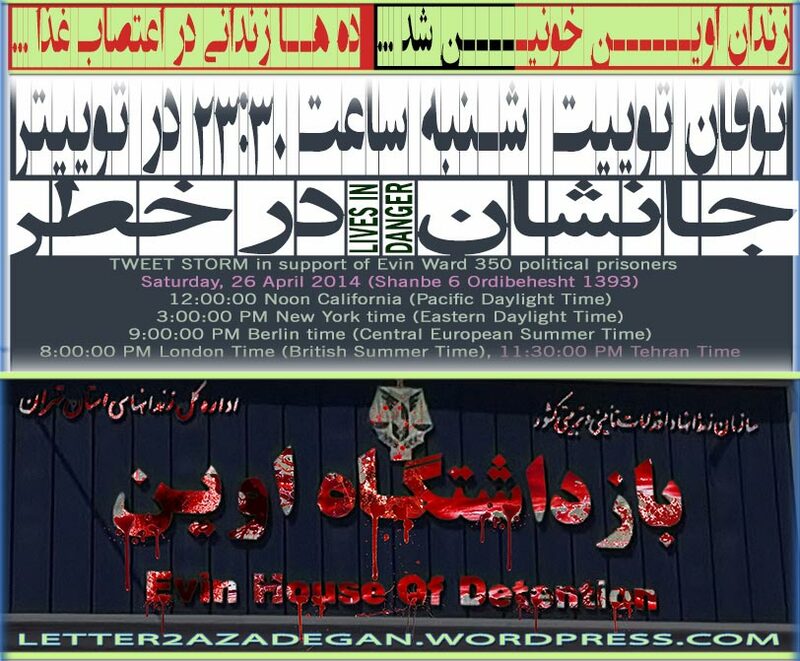 But we didn’t even know that these whispers could become so loud that they would reach the thick walls of Evin prison. When we were praying, we didn’t know what was happening. A few hours passed, it was late, the Tweet Storm had ended. Little by little, rumors were coming; rumors that were like a dream. There was talk that Dr. Khazali had been released. Soon after, the stamp, «hunger strike broken» was placed on his photo. That same photo that is on this page, the first one up from the bottom…..The Tweets that were answered. 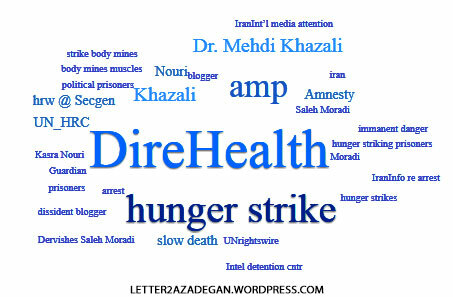 Now a year has passed and Dr. Khazali is on hunger strike again. And yet again another invitation from hearts that ache, and still, «Loud whispers from the aching hearts of the people of this village can be heard»…. Let us meet here again tomorrow night, right here on Twitter, at 10:30 PM‌ (Tehran Time). The link for the recommended tweets for the Tweet Storm will be posted here 15 minutes before the scheduled start time of the storm. It will also be posted by the Twitter account and the Facebook page of this blog. Political prisoner Dr. Mehdi Khazali and prisoners of conscious, Gonabadi Dervishes Saleh Moradi and Kasra Nouri are on hunger strike in prisons in Iran. Dr. Khazali launched a hunger strike protesting his illegal arrest and detention. Saleh Moradi and Kasra Nouri launched their hunger strike protesting the illegal detention of Gonabadi Dervishes› lawyers in solitary confinement in Evin prison. Please be their voice and bring attention to their case by joining Tweet Storm on Monday March 11 and help save their lives. «می شود گفت که نسرین بازداشت شد. قبل از آمدن او به مرخصی با تاکید به او گفته بودند که این مرخصی طولانی و به نوعی دائمی خواهد بود. وگرنه نسرین اعلام کرده بود که حاضر نیست پس از 2 سال و نیم, به مدت 3 روز به مرخصی برود. مرخصی 3 روزه بیشتر موجب خواهد شد آرامش بچه ها از بین رفته و وضع روحی آنها به هم بریزد. استدلال او کاملا درست بود همین طور هم شد. ساعت 11 امشب(دوشنبه 2 بهمن) در حالی که بچه ها گریه میکردند و حاضر نبودند از مادرشان جدا شوند و از طرف دیگر همه ی دوستان و همراهان از این احضار شوکه بودند نسرین وارد زندان شد. 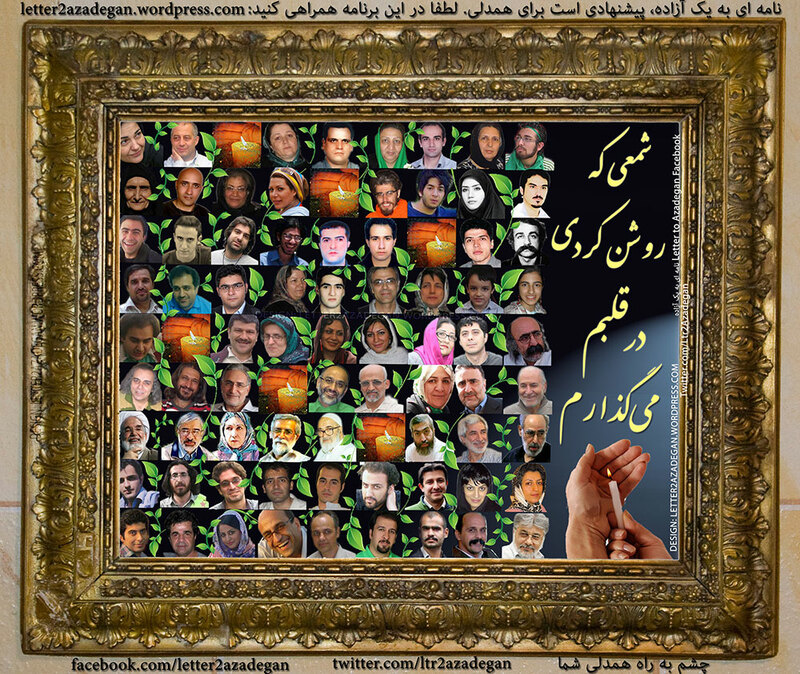 Following is translation of a post by Nasrin Sotoudeh’s husband Reza Khandan’s on his Facebook page. You can say Nasrin has been arrested again. Before she was released, they had emphasized that this furlough would be long and somewhat permanent. Otherwise, Nasrin had indicated that she is not willing to be released on a 3 day furlough after being imprisoned for more than two hand a half years. A three day furlough would more disturb the children and cause them more anxiety. She was right, this is exactly what occurred. 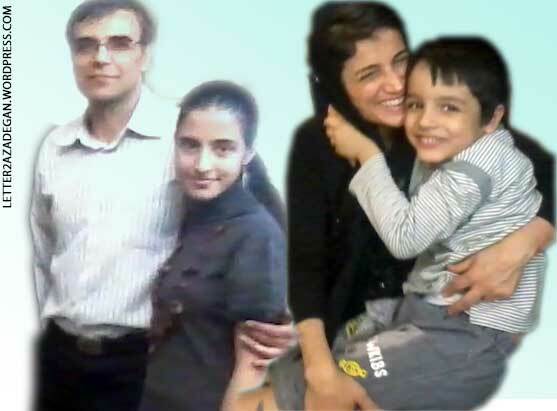 At 11:00 PM tonight (Monday, January 21), while the children were crying and did not want to separate from their mother, and among the shock of our friends about this summon, Nasrin went to prison. She emptied the suitcase she had prepared for a trip and filled it with items for prison and left. سیدحسین رونقی ملکی، وبلاگ‌نویس زندانی که در پی اعتصاب غذا به بیمارستان منتقل شده و روز گذشته بر اثر بدرفتاری ماموران امنیتی دست به اعتصاب خشک زده بود، چهارشنبه شب اعتصاب خشک خود را شکسته و اعتصاب تر را از سر گرفت. به گزارش کلمه، وی روز سه شنبه به اتاق دیگری در این بیمارستان جابه‌جا و ممنوع‌الملاقات شده و همزمان خانواده او نیز نسبت به هرگونه خبررسانی درباره وضعیت وی تهدید شده‌بودند. حسین رونقی ملکی که یکشنبه شب در پی وخامت حالش به بیمارستان منتقل شده بود، با وجود آنکه خطر از دست رفته کلیه‌اش وجود دارد، حاضر به شکستن اعتصاب غذا نشده و به همین خاطر از وصل کردن سرم نیز جلوگیری کرده است. این وبلاگ‌نویس زندانی که از دو سال و نیم قبل بدون مرخصی در زندان به سر می‌برد، معتقد است بدون پیگیری کامل درمان در خارج از زندان، امکان بهبود وضعیت او وجود ندارد. به همین خاطر او تاکید دارد که تا زمان گرفتن مرخصی درمانی، به اعتصاب غذای خود ادامه خواهد داد. اما خانواده این زندانی سیاسی نگران اند که ادامه شرایط فعلی به سرانجامی تلخ و ناگوار منجر شود. جمع گسترده‌ای از زندانیان سیاسی بند ۳۵۰ اوین نیز در نامه‌ای که دیروز در کلمه منتشر شد، هشدار داده اند که رسیدگی نگردن به وضعیت حسین رونقی، ممکن است برای او خطرات جانی در پی داشته باشد. آنها به سابقه مشابه بی‌توجهی مسئولان به سلامتی هدی صابر اشاره کرده بودند که به مرگ او منجر شد. در این نامه همچنین به نظر پزشکی قانونی که در خصوص رونقی ملکی رای به «عدم تحمل کیفر» داده است و همچنین نظر پزشکان متخصص و معالج که بر نگهداری ایشان پس از عمل در خارج از زندان تاکید کرده بودند، اشاره شده است. دو روز پیش کلمه گزارش داد که سیدحسین رونقی با آنکه از طرف ماموران امنیتی برای شکستن اعتصاب غذای خود تحت فشار است و تهدید شده که او را به زندان باز خواهند گرداند و علیه وی به جوسازی رسانه ای خواهند پرداخت، بر حق مرخصی و پیگیری درمان در خارج از زندان تاکید کرده و حاضر به شکستن اعتصاب خود نشده است. از سوی دیگر، مسئولین زندان هم که پیش‌تر اعلام کرده بودند کلیه هزینه های درمانی را تقبل می کنند، اکنون گفته‌اند که چون زندان با بیمارستان قرارداد ندارد نمی توانند هزینه ها را پرداخت کنند. این وبلاگ‌نویس و فعال حقوق بشر هم اکنون دو سال و نیم است که بدون مرخصی در زندان اوین به سر می‌برد. وی در تاریخ ۲۲ آذر ماه ۱۳۸۸ در شهر ملکان در نزدیکی تبریز بازداشت و بلافاصله به بند ۲ الف زندان اوین منتقل شد. وی مدت ۱۰ ماه را در سلول‌های انفرادی این بند زندان اوین تحت فشارهای روحی و جسمی برای اخذ مصاحبه و اعترافات تلویزیونی قرار گرفت و سرانجام از سوی شعبه ۲۶ دادگاه انقلاب اسلامی به ۱۵ سال حبس تعزیری محکوم شد. Blogger and human rights activist Hossein Ronaghi Maleki who was transferred to hospital in dire health Sunday night, ends his dry hunger strike (refusing food and liquids), but remains on a hunger strike. According to reports by Kalameh, Hossein’s hospital room was stormed by IRGC agents Tuesday night and he was moved to a different room in the same hospital. To protest this action by IRGC agents Hossein announced Tuesday night that he will go on a dry hunger strike, but as on Wednesday night he ended his dry hunger strike but remains on a hunger strike. Hossein Ronaghi Maleki was taken to hospital Sunday night in dire health, but despite the danger of loosing his kidney he has refused to be connected to an IV and has refused to end his hunger strike. This blogger who has been incarcerated for two and a half years without being granted furlough, believes having additional surgery without being granted a medical furlough for post-operation treatment is pointless and therefore refuses additional surgery and will remain on a hunger strike until medical furlough is granted. A number of political prisoners incarcerated in Ward 350 released a statement yesterday which was published by Kalameh site. In this statement they warned that ignoring Hossein’s situation could put his life in serious danger. In their statement, they referred to a similar case of another political prisoner, Hoda Saber, who lost his life on hunger strike in prison, due to lack of proper medical treatment. 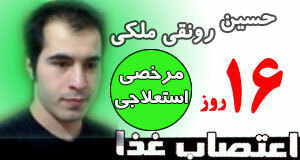 Hossein Ronaghi Maleki launched a hunger strike last week Saturday. He announced the launch of his hunger strike in a letter to the Leader. 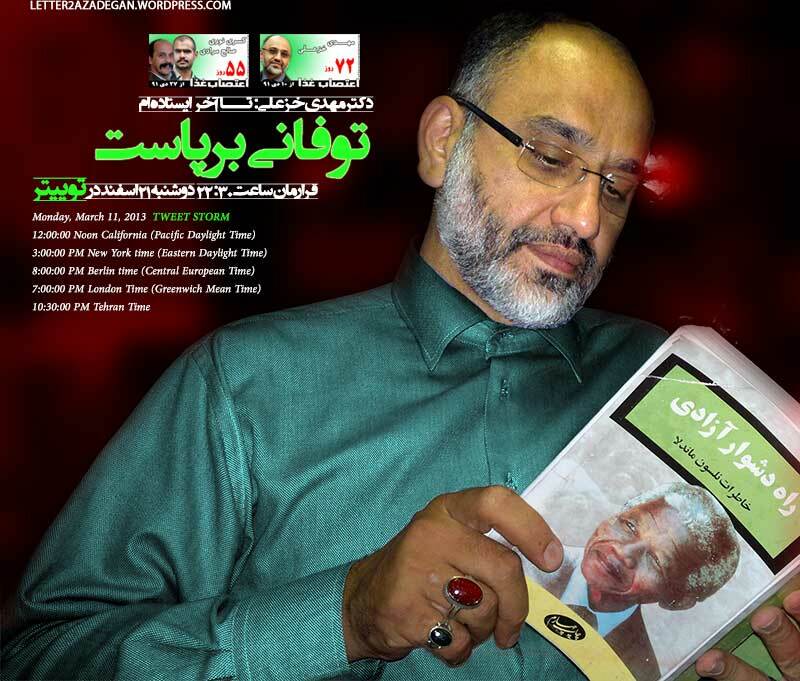 In this letter he explained the reason for his hunger strike and said, ” “I protest these illegal practices by launching a hunger strike as of May 26, 2012 and protecting my life is the responsibility of the officials of the Islamic Republic. Kalameh reported few days ago that Hossein Ronaghi is under pressure to brake his hunger strike and has been threatened with being transfered back to prison. They also have threatened him with a negative media campaign against him. This blogger and human rights activist has been incarcerated for two and a half years without being allowed any furlough. He was arrested on December 13, 2009 in the city of Makan near Tabriz, and was immediately taken to Ward 2-A of Evin prison in Tehran.